← The Refractive Thinker takes home 13th award! Welcome to 2015! Download our Refractive Thinker® & Pensiero Press 2015 Catalog to see all 10 volumes in the 13-time award winning Refractive Thinker® series, as well as the award winning books from Pensiero Press. Please find our 11th volume that will debut in March of 2015, Volume IX: Effective Business Practices in Leadership and Emerging Technologies. 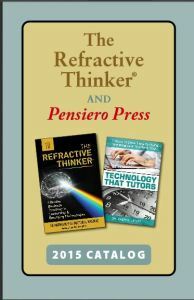 This entry was posted in Announcements and tagged Dr. Cheryl Lentz, Pensiero Press, The Refractive Thinker. Bookmark the permalink.